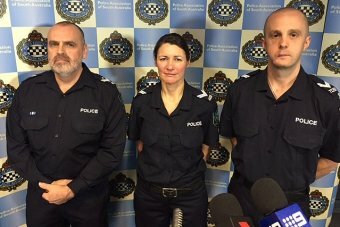 New laws allowing up to five years’ jail time for people who spit or throw “bodily materials” at police officers or emergency workers in South Australia do not go far enough, according to the police union. Attorney-General Vickie Chapman said the Government would remove the offence of assaulting a police officer from the Summary Offences Act so it could be dealt with under the heftier Criminal Law Consolidation Act. She said the new bill aimed to see tougher sentences handed down to people who spat, urinated or threw faeces at responders. But the Police Association of SA said there needed to be a dedicated offence for different types of assault on an officer, and also wanted sentencing laws amended so they were only handed out in exceptional circumstances. “We had the case last year when a drug-affected man chased a police officer around with a pair of scissors trying to kill that police officer and he got a suspended sentence,” union president Mark Carroll said. Ms Chapman said the Government was working through other proposals with the union, but spitting was one area where there was “a gap in the law”. “[Spitting] is not only prolific, but it really needs to be addressed for all emergency workers, and in our view is deserved of having a new and dedicated offence for that in our criminal law, not in our summary law,” Ms Chapman said. People who “smeared themselves in human biological material with the intention of transferring it to a police officer or prison guard” would also be captured by the law, she said. Senior Constable Alison Coad was infected with oral herpes while on duty in Adelaide in 2003. She had used capsicum spray to disarm a knife-wielding man who was arguing with his female partner in Whitmore Square in the CBD. The woman responded aggressively to police intervention and also had to be subdued with capsicum spray. The Senior Constable said that while “decontaminating” the woman afterwards with a water bottle, the woman “deliberately hawked some up from the bottom of her mouth, leaned into me and spat”. “I copped a mouthful, tennis ball-sized,” she told the ABC in 2015. The woman then swore at the officer, telling her she had AIDS, hepatitis C and herpes and that Senior Constable Coad would have it too. The policewoman later learned during the first trimester of a pregnancy that she had contracted herpes from the incident and regularly has to take “expensive anti-viral medication” with strong side effects. Her attacker reportedly fled to NSW after the incident while awaiting trial on hindering and assaulting police and is unlikely to be extradited because the cost of doing so outweighs the charges.